Plastics in many cases are non-inflammable, self extinguishable, and burn very slowly. Easy maintenance of plastic surfaces. (a) Hardness: Plastics are not very hard, their hardness being comparable tot hat of brass and aluminum. Generally, thermosets are harder than thermoplastics. The temperature of the material substantially affects its properties. The hardness of commonly used plastics is in the range of 5-50 BHN. (b) Stress-Strain Behavior: When the plastic is subjected to uni-axial load, it deforms permanently an ultimately fails as shown in fig. Tensile strengths of plastics may be in the range of 10 to 100MPa. The modulus of elasticity for plastic is in the range of 10 MPa to 4000 MPa. Tensile strength decreases with increasing temperature. Some of the plastics are brittle in nature. The mechanical properties of the plastics depends upon the strain rate, temperature, and environmental conditions. (c) Creep: The molecular weight of the polymer affects its creep behavior. As the molecular weight of the polymer increases, it becomes more creep resistant. When a plastic is subjected to a constant load, it deforms continuously. The plastic will continue to deform slowly with long time or until fails. The creep depends on several factors such as: types of plastic, load applied, temperature and time. 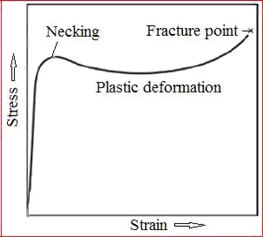 (d) Fatigue Behavior: Fatigue failure of thermosets is brittle in nature, but in case of thermoplastics failure occurs due to initiation of crack propagation. The flexural fatigue strength of plastics may be in the range of 105 - 107 numbers of cycle to failure at room temperature (20˚C).